A rendering filed with Nordstrom's application to the Kansas City Planning Department shows the proposed store facing the intersection of Jefferson Street and Nichols Road. The Country Club Plaza could have a dramatically contemporary, new west edge where Nichols Road meets Jefferson Street, after approval this week of the design for a planned Nordstrom department store. The City Plan Commission unanimously endorsed the style of the 122,000 square-foot store, which was described by the Plaza's co-owner, the Taubman company, as a “once in a generation opportunity” to pump new retail life into the iconic shopping district. “We see the addition of Nordstrom … as a great opportunity to assure the sustainability of the Plaza as a regional shopping center for years to come,” John Eggert of Taubman development told the commissioners. The Plan Commission recommendation will now go to the City Council for final consideration. The new Nordstrom would mark the return of a department store to the Plaza, which has been without one since Halls closed in 2014. It is expected to open in 2021. 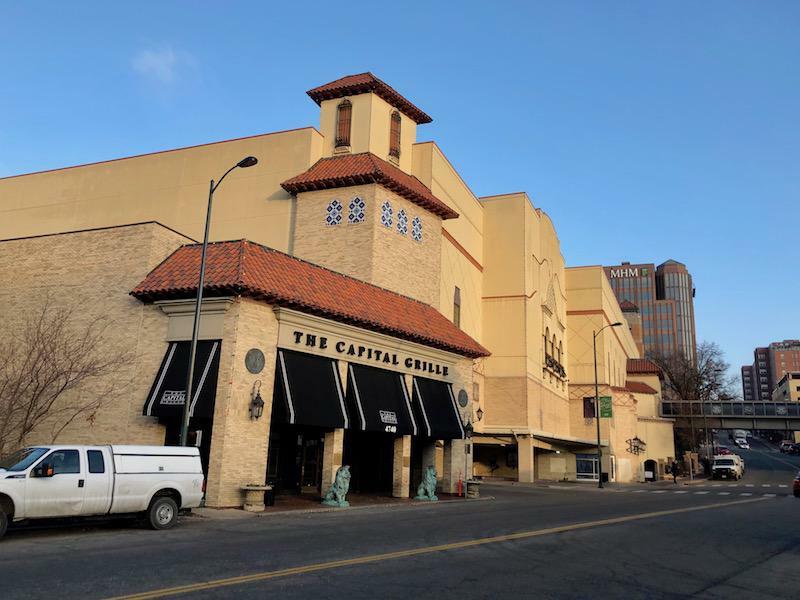 The project would require demolition of roughly a half-block of buildings along the west edge of Jefferson Street next to the Unity Temple at the Plaza, which currently includes the Capital Grille, a Bank of America branch and several Cinemark Palace auditoriums on the second level. The skywalk over Jefferson linking the movie auditoriums with the main Cinemark theater in the Seville building would be removed. 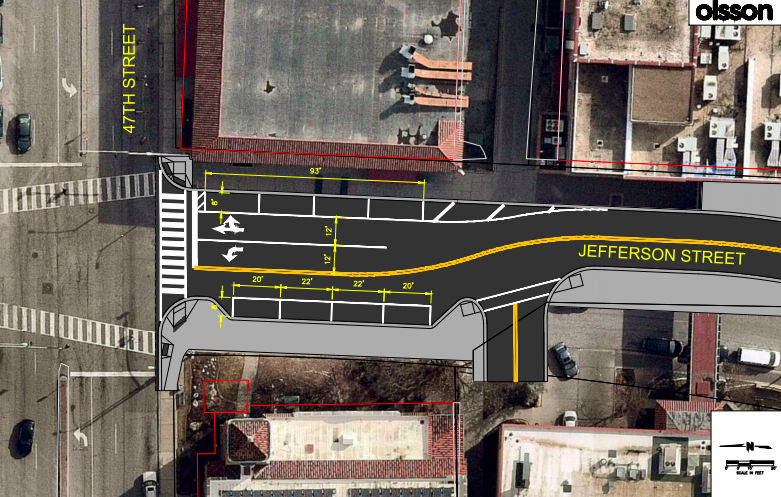 Jefferson Street also would be narrowed to improve pedestrian access to the new Nordstrom from the rest of the Plaza. This group of buildings along Jefferson Street, including the skywalk, will be demolished to make way for the planned Nordstrom. Taubman officials were noncommittal about the future of the remaining Cinemark operation, saying it may continue as a movie theater or converted to another use. In their report to the City Plan Commission, city planners said they were comfortable with how the new store’s design would fit with the historic Spanish style that dominates the Plaza. “The two-story modern structure draws from the color palette of the Plaza but is otherwise more modern, including a curving façade along Jefferson Street primarily consisting of glass, textured metal panels, and architectural panels made of composite material with horizontal color banding,” according to staff. “Staff feels that a purposeful streetscape along 47th Street which includes in its design stylistic features such as streetlight fixtures, brick pavers, and other place-making elements throughout the district … will help to implement the spirit of the Plaza in the design while not trying to force the Nordstrom design take a faux-historical approach or add ill-suited decorative elements," they added. While the commercial buildings facing Jefferson would be razed, most of the garage behind them would remain intact. About 200 spaces would be removed, but 1,000 would remain. The garage would have one entrance point close to where Nichols Road ends at Jefferson between the Nordstrom and Unity Temple. Documents filed with Nordstrom's application to the Kansas City Planning Department show Jefferson Street will be narrowed to improve pedestrian access to the new Nordstrom store. The new look of Jefferson would be a contemporary department store with large windows facing the Plaza. The project calls for removing what designers called the “canyon effect” of the current entrance and instead create a more open and welcoming entrance that also includes improvements for pedestrians. A current cramped garage sidewalk would be combined with the Unity Temple sidewalk to provide more space. “The Plaza is a notably unique district in Kansas City. It has rich history and is an attraction for the region and beyond; it is a part of the city which many locals and visitors alike feel a special relationship to and have strong feeling about both the history and the future of. “Due to the importance the Plaza holds in the city, changes in the district are looked at with great scrutiny, with context and sensitivity to historic fabric a fundamental element of the review. “It must be noted that the Plaza is not a registered district on the National Register of Historic Places and no individual buildings on the Plaza hold that designation. “Additionally, while some of the original buildings, primarily located on 47th Street between Broadway Boulevard and Wyandotte Street, were constructed in the early-to-mid 1920s, many buildings were later additions, built in the 1930s, 1960s, or later (as recent as the 2000s). “Over the 90+ year history of the Plaza, many buildings have undergone significant façade—and use—changes that reflect changes in both architectural trends and the retail market. In the case of 4720 Jefferson, the structure was built in 1998. “There are numerous challenges in bringing new development to an area with such history and significance. Editor's note: This story has been updated to note that the Plan Commission's recommendation must go before the City Council for final consideration. A plan to demolish a prominent church on the Country Club Plaza and replace it with a 12-story, mixed-use project is unfolding as the latest historic preservation battle over the soul of the venerable district. Legacy Development wants to redevelop the current site of the Seventh Church of Christ, Scientist at the northwest corner of 47th and Pennsylvania, according to a proposal submitted recently to the City Plan Commission. Kansas City’s Country Club Plaza will soon have a new owner. Country Club KC Partners LLC is buying the Plaza for $660 million, Highwoods Properties announced Monday. The deal is expected to be finalized in the first quarter. Country Club KC Partners is an equal partnership between Taubman Centers and the Macerich Company, which are based in Michigan and California, respectively. Both companies own and manage dozens of malls and shopping centers.